This is a general information tool for medical professionals and is not a complete representation of the product(s)’ Instructions for Use (IFU) or Package Insert, and it is the medical professional’s responsibility to read and follow the IFU or Package Insert. The information provided may suggest a technique or protocol; however, it is the sole responsibility of the medical professional to determine which technique or protocol is appropriate. At all times, clinicians remain responsible for utilizing sound patient evaluation and selection practices and for complying with applicable local, state, and federal rules and regulations regarding accreditation, reimbursement, and all other aspects of procedures. In no event shall Hologic be liable for damages of any kind resulting from your use of the information presented. We see patients every day on labor and delivery triage with symptoms of preterm labor. Most of these patients will not progress and ultimately deliver at term. Although strides have been made in supportive care for babies born at <37 weeks’ gestation, there is still a great need for better implementation of available tools to evaluate which patients with symptoms of preterm labor are most likely to deliver imminently and which can be discharged home and are likely to deliver at term. Currently, practitioners have few tools to assess the risk of a patient delivering preterm. The Rapid fFN test (Hologic, Inc., Marlborough, MA, USA), which determines the presence of fetal fibronectin in cervicovaginal secretions for women with symptoms of preterm labor between gestational ages of 24 weeks, 0 days and 36 weeks, 6 days, has been in use for over 20 years for evaluating preterm birth risk. 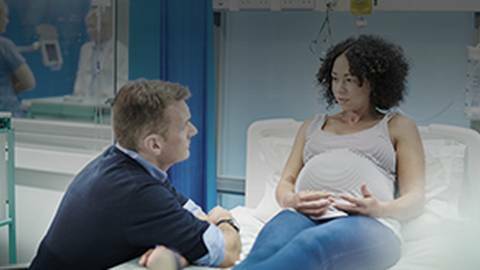 Since its approval, the Rapid fFN test has been shown in numerous peer-reviewed studies to reduce unnecessary admissions, maternal transfers, and length of stay and has been used to guide the appropriate timing of antenatal corticosteroids. Our goal as clinicians is to provide the best in care through the practice of evidence-based medicine. This includes using all the tools available to evaluate a patient with symptoms of preterm labor and decide the best treatment plan for her and her baby. Inside the pages of this monograph are the experiences and opinions of recognized experts in the field of obstetrics and maternal-fetal medicine, along with in-depth reviews of the most up-to-date literature related to preterm labor assessment. The physician and nurse authors of these articles are paid consultants of Hologic, Inc., and editorial and financial support was provided to the authors by Hologic in connection with the development of their articles. I hope you will take the time to read the information provided and incorporate these findings into your practice. We at Hologic are committed to our partnership with you, the women’s healthcare provider, to ensure that you have the most well-established technologies and data to feel comfortable counseling and treating your patients with symptoms of preterm labor. 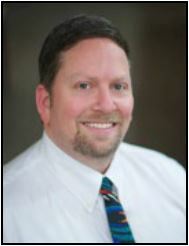 Dr. Richard Broth is a Perinatologist from the DC Metro area. 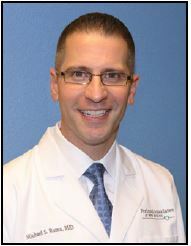 Dr. Broth was awarded his medical doctorate in 1996 from the University of Maryland, and he completed his residency in obstetrics and gynecology at University of Medicine and Dentistry of New Jersey in Newark. 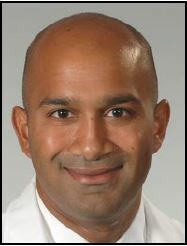 He also completed a fellowship in maternal-fetal medicine at Thomas Jefferson Medical College. 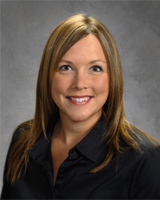 Dr. Broth opened TLC Perinatal, a private maternal-fetal medicine practice, in 2011 and is also Attending Perinatologist on staff with University of Maryland Capital Regional Health Care System and works at Prince George’s Hospital Center. 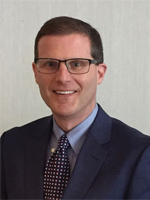 Dr. Broth is board certified in both obstetrics and gynecology and maternal-fetal medicine, and he has an interest in evidence-based improvements to prenatal care. He is a member of the American College of Obstetricians and Gynecologists as well as a Fellow of the Society of Maternal-Fetal Medicine. In the age of modern obstetrics, obstetricians have been plagued by 2 specific, high-risk disorders: preeclampsia and preterm labor (PTL). Although a large body of literature has been published on these topics, we are far from a clinical “cure” for either. The best we can do is temporize until we are no longer able and then hope the neonatal intensive care unit is able to provide any additional support required. Although neonatal medicine has made great advancements and many centers are able to push the limits of viability to include fetuses who are ≥23 weeks’ gestational age and >500 g with varying degrees of success,1 the emotional, medical, and financial challenges could be better curtailed if there were more advanced planning and intervention. Prolongation of pregnancy by a month, a few weeks, days, and even hours can potentially make a difference in the neonatal outcome. Conversely, the use of overly aggressive treatment approaches arising from the inability to accurately diagnose PTL is not the best approach. Is there a way to identify women at the highest risk for PTL and hone a treatment plan for those cases? Is there testing that can complement our clinical evaluation? If we standardize the approach within and across institutions, we may begin to answer these questions and have an even larger and more global positive impact on neonatal outcomes. The first thing we notice in our patient’s obstetric history are any risk factors for PTL, including African American race, age younger than 18 years or older than 35 years, low socioeconomic status, increased maternal stress, prior spontaneous preterm birth, multiple gestation, uterine anomaly, early vaginal bleeding, low pre-pregnancy weight, and/or behavioral tendencies (tobacco, substance use), among others (Table 1).2 The problem is that approximately two-thirds of patients with traditional risk factors do not deliver preterm.3 Additionally, half of patients who deliver preterm have no risk factors.4 This underscores the concern that even the best clinicians will be unable to follow the appropriate patients in anticipation of a preterm delivery. Traditional risk factors are not necessarily reliable for predicting which patients are likely to deliver preterm, so we should be prepared to act quickly once patients with symptoms of PTL arrive in triage or the emergency department. Historically, we would use our clinical assessment combined with data from our patient’s history (e.g., recent trauma, infection), physical examination (signs/symptoms of intraamniotic infection or abruption and interval cervical change), monitoring (uterine contractions, fetal heart rate), and laboratory findings (complete blood count) to determine the level of clinical concern. If the patient is stable, she would be discharged. If she were to have any clinical concerns, she would be admitted and treated with antenatal therapy. Treatment with magnesium sulfate, betamethasone, and sometimes even antibiotics can be used,5 but it is important to remember that such treatment may also expose the patient to unnecessary risks, including the potential for magnesium toxicity,6 premature use of steroids for fetal lung maturity (as we no longer advocate repetitive dosing), and antibiotic resistance.7 Additionally, the financial implications of prolonged hospital stays8 may be too burdensome. What other tools do we have to assess true versus false PTL? Much has been written in the recent literature evaluating 2 specific modalities: a physical assessment using transvaginal cervical length and a biochemical assessment using fetal fibronectin (fFN).9 Cervical length has been shown to be directly correlative; the longer the cervix, the less likely the patient will deliver preterm.10 Ideally, the normal cervix should measure ≥2.5 cm, although some studies have associated cervical lengths as short as 1.5 cm with an intermediate risk of preterm delivery.11 fFN is a glycoprotein that is found in very low levels in the cervicovaginal secretions after week 22 of gestation.12 Unlike most tests in which we assess the positive predictive value of the result and answer the question, “What is the likelihood of X to occur if the test is positive?”, the brilliance of the approach for Rapid fFN testing is that we evaluate the negative predictive value (NPV) and answer the question, “What is the likelihood that this patient will NOT deliver within the next two weeks if the test is negative?” Because the NPV for Rapid fFN is approximately 99%13, the results allow healthcare providers to feel reassured that their symptomatic patients are unlikely to deliver within the next 7 days.14 Moreover, a patient who is discharged on the basis of a negative Rapid fFN result can feel confident about being managed as an outpatient, remaining in a comfortable environment with her loved ones. She will also—at least temporarily—avoid exposure to mistimed steroids (that may need to be given at a later time) and to potentially harmful effects from tocolytic therapy. Finally, the ability to confidently discharge patients home may have many benefits in terms of reduced demands on physician time and healthcare resources, thus providing potential cost savings. Recent data show that the use of either cervical length measurements or fFN increases predictive accuracy relative to clinical assessment alone.9 Importantly, there is an additive benefit when cervical length and fFN are used together,15 especially in patients whose cervical length is in the “gray” zone – not long enough to be reassuring and not short enough to cause worry that delivery is imminent. When women have normal cervical length and a negative Rapid fFN result, 98% will deliver at ≥35 weeks.16 However, even a patient with a short cervical length and a positive Rapid fFN result will deliver at 37 weeks or later nearly 50% of the time.9 The additive benefit of cervical length measurement and Rapid fFN testing offers the highest specificity and NPV, 96.8% and 98.9%, respectively, when used to predict short-term risk (i.e., delivery within 7 days), making it especially useful for determining acute intervention such as steroid therapy.9 The number of patients needed to treat to prevent 1 case of respiratory distress syndrome is only 17 when fFN is positive, but it increases to 509 in instances of a negative fFN (Figure 1).17 This further emphasizes the need for better predictive accuracy to more appropriately intervene with magnesium sulfate, tocolytic therapy, steroids, or patient transfer to a more advanced hospital. Current data indicate that only 23% of women receive steroids in an optimal time frame (defined as exposure to antenatal corticosteroid [ACS] between 24 hours and 7 days before delivery), 34% receive them suboptimally, and 52% have questionably appropriate exposure to ACS in that they are exposed to ACS but deliver >35 weeks gestation,18 suggesting that steroids are often administered unnecessarily. 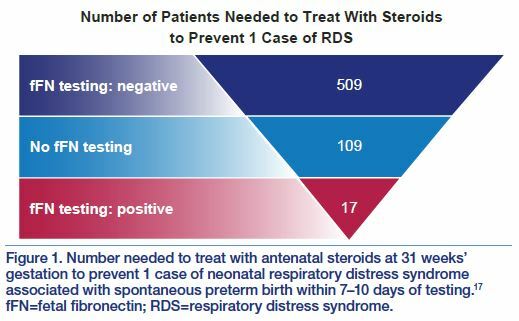 When fetuses receive steroids 15 to 21 days before delivery, they have a composite outcome morbidity rate (chronic lung disease, intraventricular hemorrhage, necrotizing enterocolitis, proven sepsis, and periventricular leukomalacia) almost 7 times greater than those receiving steroid therapy within the 0 to 7 days before delivery.19 As we get essentially 1 chance to treat our patient, shouldn’t we make it count? The climate of medicine is continuously changing. The latitude to manage patients based on a “gut feeling” without an evidence-based foundation is no longer accepted or acceptable. One can look at the glass as half empty and believe that professional recommendations hamstring one’s ability to practice the “art of medicine.” Alternatively, we can look at this as a way to fulfill our Hippocratic oath to “respect the hard-won scientific gains of those physicians in whose steps I walk” and “apply, for the benefit of the sick, all measures [that] are required, avoiding those twin traps of overtreatment and therapeutic nihilism.”22 It seems certain that PTL is still the leading cause of neonatal morbidity and mortality with a heterogeneous and complex etiology not amenable to a single diagnostic test. Along with other assessments, fFN can help manage decisions for symptomatic patients. It seems reasonable to achieve virtually 100% compliance with a reasonable and standardized triage protocol/algorithm. Lemons JA, Bauer CR, Oh W, et al. Very low birth weight outcomes of the National Institute of Child Health and Human Development Neonatal Research Network, January 1995 through December 1996. NICHD Neonatal Research Network. Pediatrics. 2001;107:E1. National Institute of Child Health and Human Development. 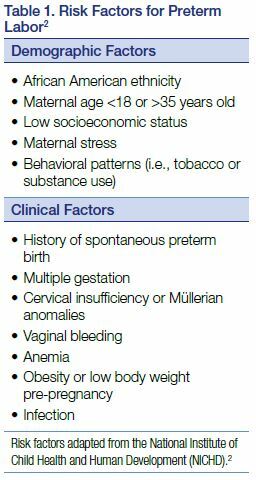 What are the risk factors for preterm labor and birth? Available at: https://www.nichd.nih.gov/health/topics/preterm/conditioninfo/who_risk. Accessed October 5, 2018. Nageotte MP, Casal D, Senyei AE. Fetal fibronectin in patients at increased risk for premature birth. Am J Obstet Gynecol. 1994;170:20-25. Iams JD, Goldenberg RL, Mercer BM, et al. The preterm prediction study: can low-risk women destined for spontaneous preterm birth be identified? Am J Obstet Gynecol. 2001;184:652-655. American College of Obstetricians and Gynecologists’ Committee on Practice Bulletins. Practice Bulletin No. 171: Management of Preterm Labor. Obstet Gynecol. 2016;128:e155-164. Elliott JP, Morrison JC, Bofill JA. Risks and benefits of magnesium sulfate tocolysis in preterm labor (PTL). AIMS Public Health. 2016;3:348-356. Martinez de Tejada B. Antibiotic use and misuse during pregnancy and delivery: benefits and risks. Int J Environ Res Public Health. 2014;11:7993-8009. Rose CH, McWeeney DT, Brost BC, Davies NP, Watson WJ. Cost-effective standardization of preterm labor evaluation. Am J Obstet Gynecol. 2010;203:250. DeFranco EA, Lewis DF, Odibo AO. Improving the screening accuracy for preterm labor: is the combination of fetal fibronectin and cervical length in symptomatic patients a useful predictor of preterm birth? A systematic review. Am JObstet Gynecol. 2013;208:233. Fuchs I, Tsoi E, Henrich W, Dudenhausen JW, Nicolaides KH. Sonographic measurement of cervical length in twin pregnancies in threatened preterm labor. Ultrasound Obstet Gynecol. 2004;23:42-45.
van Baaren GJ, Vis JY, Wilms FF, et al. Predictive value of cervical length measurement and fibronectin testing in threatened preterm labor. Obstet Gynecol. 2014;123:1185-1192. Deshpande SN, van Asselt AD, Tomini F, et al. Rapid fetal fibronectin testing to predict preterm birth in women with symptoms of premature labour: a systematic review and cost analysis. Health Technol Assess. 2013;17:1-138. Rapid fFN for the TLiIQ System [package insert]. AW-04196-001, Rev. 004, Sunnyvale, CA: Hologic, Inc.; 2017. Iams JD, Casal D, McGregor JA, et al. Fetal fibronectin improves the accuracy of diagnosis of preterm labor. Am J Obstet Gynecol. 1995;173:141-145. Audibert F, Fortin S, Delvin E, et al. Contingent use of fetal fibronectin testing and cervical length measurement in women with preterm labour. JObstet Gynaecol Can. 2010;32:307-312. Goldenberg RL, Iams JD, Das A, et al. The Preterm Prediction Study: sequential cervical length and fetal fibronectin testing for the prediction of spontaneous preterm birth. National Institute of Child Health and Human Development Maternal- Fetal Medicine Units Network. Am J ObstetGynecol. 2000;182:636-643. Honest H, Bachmann LM, Gupta JK, Kleijnen J, Khan KS. Accuracy of cervicovaginal fetal fibronectin test in predicting risk of spontaneous preterm birth: systematic review. BMJ. 2002;325:301. Razaz N, Skoll A, Fahey J, Allen VM, Joseph KS. Trends in optimal, suboptimal, and questionably appropriate receipt of antenatal corticosteroid prophylaxis. Obstet Gynecol. 2015;125:288-296. Wilms FF, Vis JY, Pattinaja DA, et al. Relationship between the time interval from antenatal corticosteroid administration until preterm birth and the occurrence of respiratory morbidity. Am JObstet Gynecol. 2011;205:49. Committee on Patient Safety and Quality Improvement and Committee on Professional Liability. Committee opinion no. 629: clinical guidelines and standardization of practice to improve outcomes. Obstet Gynecol. 2015;125:1027-1029. Abenhaim HA, Morin L, Benjamin A. Does availability of fetal fibronectin testing in the management of threatened preterm labour affect the utilization of hospital resources? J ObstetGynaecol Can. 2005;27:689-694. Lasagna L, Association of American Physicians and Surgeons Inc. Physician Oaths: A Modern Hippocratic Oath. Available at: http://www.aapsonline.org/ethics/oaths.htm. Accessed October 5, 2018. Perinatal Associates of New Mexico is the largest provider of perinatal care in the state of New Mexico. With subspecialty training in maternal-fetal medicine, our practice cares for pregnant women with a variety of medical, surgical, and obstetric complications. With specific training in ultrasound for prenatal diagnosis, detection of fetal growth abnormalities, and cervical length evaluation, each patient seen in our office receives high-quality care. We hold ourselves to the highest standards in ultrasound performance, investing significant time and effort in annual renewal of our practice accreditation in ultrasound. Understanding the limitations of ultrasound, we also routinely implement fetal fibronectin testing to most accurately assess the risk of spontaneous preterm birth in patients with symptoms of labor. Understanding the normal distribution of cervical lengths across gestation, a cervical length of <25 mm is widely accepted as shortened relative to the 5th and 10th percentile of all cervical lengths.8,10 Women with high risk pregnancies and a cervical length <25 mm are at a higher risk of sPTB.11 Furthermore, in a large cohort of pregnant women (N=2915, with both high- and low-risk pregnancies), the relative risk of preterm delivery with a cervical length of ≤22 mm at 24 weeks was 9.49 (95% CI, 5.95–15.15).8 Based on much of these early data, substantive research has been performed to determine the utility of TVUS to measure the cervical length in patients with and without a history of sPTB. The clinician has a variety of tools to choose among when evaluating pregnant women with symptoms of PTL. Each of these tools has inherent benefits and limitations and varies in its predictive value for sPTB. Given the significant variation in measurements of cervical length using TVUS, this tool should be used only by individuals with specific training who can demonstrate their technical aptitude to proficiently acquire proper images. Ideally, images should undergo routine quality review. If TVUS or appropriately trained providers are not available at an institution evaluating women with symptoms of PTL, fFN testing can provide objective and reliable results. 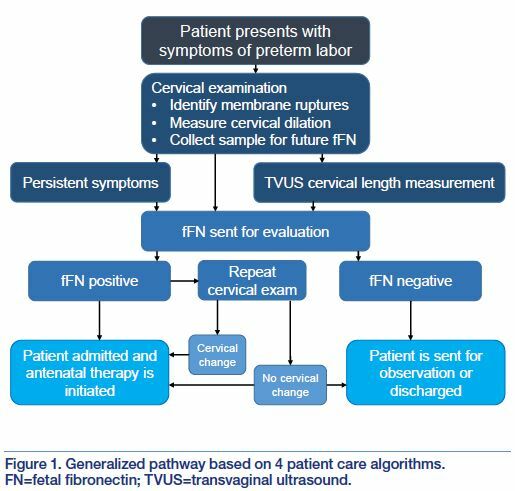 Furthermore, when TVUS and properly trained providers are available, TVUS cervical length measurements and fFN testing should be used together (Figure 1) to provide the most accurate assessment of risk of sPTB in patients presenting with symptoms of PTL. American College of Obstetricians and Gynecologists’ Committee on Practice Bulletins. Practice Bulletin No. 171: Management of Preterm Labor. Obstet Gynecol. 2016;128(4):e155-164. Iams JD. Prediction and early detection of preterm labor. Obstet Gynecol. 2003;101(2):402-412. Goldenberg RL, Culhane JF, Iams JD, Romero R. Epidemiology and causes of preterm birth. Lancet. 2008;371(9606):75-84. Ruma MS, Bittner KC, Soh CB. Current perspectives on the use of fetal fibronectin testing in preterm labor diagnosis and management. AmJ Manag Care. 2017;23(19 suppl):S356-S362. Crane JM, Hutchens D. Transvaginal sonographic measurement of cervical length to predict preterm birth in asymptomatic women at increased risk: a systematic review. Ultrasound Obstet Gynecol. 2008;31(5):579-587. Goldenberg RL, Iams JD, Mercer BM, et al. The preterm prediction study: the value of new vs standard risk factors in predicting early and all spontaneous preterm births. NICHD MFMU Network. Am J Public Health. 1998;88(2): 233-238. Peaceman AM, Andrews WW, Thorp JM, et al. Fetal fibronectin as a predictor of preterm birth in patients with symptoms: a multicenter trial. Am JObstet Gynecol. 1997;177(1):13-18. Iams JD, Goldenberg RL, Meis PJ, et al. The length of the cervix and the risk of spontaneous premature delivery. National Institute of Child Health and Human Development Maternal Fetal Medicine Unit Network. N Engl J Med. 1996;334(9):567-572. Markham KB, Iams JD. Measuring the cervical length. Clin Obstet Gynecol. 2016;59(2):252-263. Hibbard JU, Tart M, Moawad AH. Cervical length at 16-22 weeks’ gestation and risk for preterm delivery. Obstet Gynecol. 2000;96(6):972-978. O’Hara S, Zelesco M, Sun Z. Cervical length for predicting preterm birth and a comparison of ultrasonic measurement techniques. Australas JUltrasound Med. 2013;16(3):124-134. Berghella V, Palacio M, Ness A, et al. Cervical length screening for prevention of preterm birth in singleton pregnancy with threatened preterm labor: systematic review and meta-analysis of randomized controlled trials using individual patient-level data. Ultrasound Obstet Gynecol. 2017;49(3):322-329. DeFranco EA, Lewis DF, Odibo AO. Improving the screening accuracy for preterm labor: is the combination of fetal fibronectin and cervical length in symptomatic patients a useful predictor of preterm birth? A systematic review. Am JObstet Gynecol. 2013;208(3):233. Dutta D, Norman JE. The efficacy of fetal fibronectin testing in minimising hospital admissions, length of hospital stay and cost savings in women presenting with symptoms of pre-term labour. J Obstet Gynaecol. 2010;30(8):768-773. Hiersch L, Melamed N, Aviram A, et al. Role of cervical length measurement for preterm delivery prediction in women with threatened preterm labor and cervical dilatation. J Ultrasound Med. 2016;35(12):2631-2640. Melamed N, Hiersch L, Domniz N, et al. 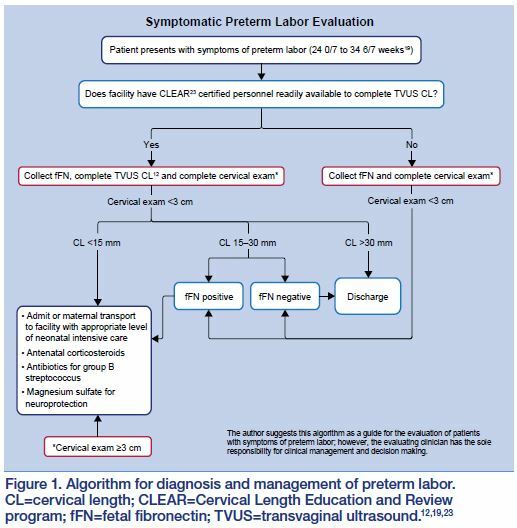 Predictive value of cervical length in women with threatened preterm labor. Obstet Gynecol. 2013;122(6):1279-1287. Berghella V, Saccone G. Fetal fibronectin testing for prevention of preterm birth in singleton pregnancies with threatened preterm labor: a systematic review and metaanalysis of randomized controlled trials. Am J ObstetGynecol. 2016;215(4):431-438.
van Baaren GJ, Vis JY, Wilms FF, et al. 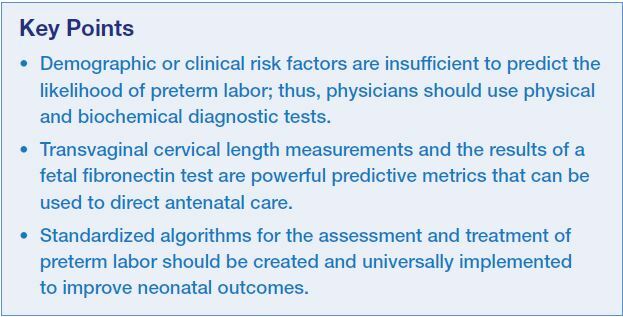 Predictive value of cervical length measurement and fibronectin testing in threatened preterm labor. Obstet Gynecol. 2014;123(6):1185-1192. American College of Obstetricians and Gynecologists. ACOG Practice Bulletin No. 101: ultrasound in pregnancy. Obstet Gynecol. 2016;128:e241-e256. 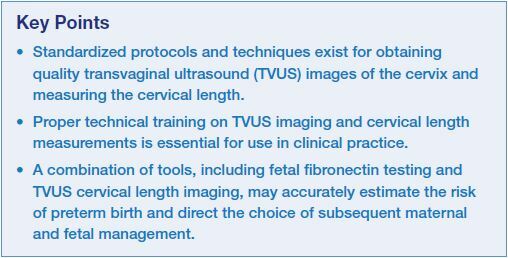 Berghella V, Bega G, Tolosa JE, Berghella M. Ultrasound assessment of the cervix. Clin ObstetGynecol. 2003;46(4):947-962. Yost NP, Bloom SL, Twickler DM, Leveno KJ. Pitfalls in ultrasonic cervical length measurement for predicting preterm birth. Obstet Gynecol. 1999;93(4):510-516. Perinatal Quality Foundation. Cervix measurement criteria: measurement of the cervix. Perinatal Quality Foundation. Available at: https://clear.perinatalquality.org/Docs/image_criteria.pdf. Accessed December 19, 2018. Schnettler W, March M, Hacker MR, Modest AM, Rodriguez D. Impaired ultrasonographic cervical assessment after voiding: a randomized controlled trial. Obstet Gynecol. 2013;121(4):798-804. Boelig RC, Feltovich H, Spitz JL, et al. Assessment of transvaginal ultrasound cervical length image quality. Obstet Gynecol. 2017;129(3):536-541. Iams JD, Grobman WA, Lozitska A, et al. Adherence to criteria for transvaginal ultrasound imaging and measurement of cervical length. AmJ Obstet Gynecol. 2013;209(4):365 e361-365. Parry E, Singh TG, Dow D, Noovao F. Improved management in threatened preterm labour with rapid fetal fibronectin testing. Aust N Z J ObstetGynaecol. 2006;46(3):240-241. Luzzi V, Hankins K, Gronowski AM. Accuracy of the rapid fetal fibronectin TLi system in predicting preterm delivery. Clin Chem. 2003;49(3): 501-502. Tekesin I, Marek S, Hellmeyer L, Reitz D, Schmidt S. Assessment of rapid fetal fibronectin in predicting preterm delivery. Obstet Gynecol. 2005;105(2):280-284. Gomez R, Romero R, Medina L, et al. 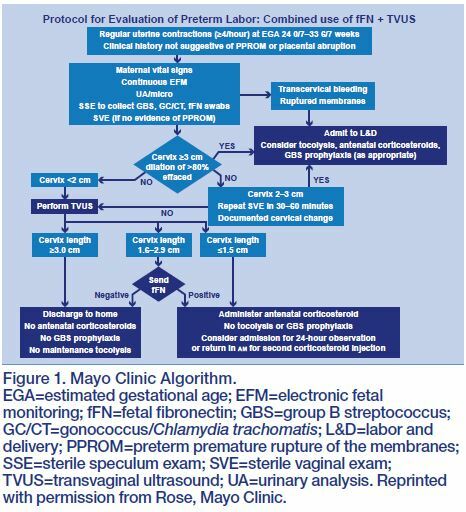 Cervicovaginal fibronectin improves the prediction of preterm delivery based on sonographic cervical length in patients with preterm uterine contractions and intact membranes. Am J ObstetGynecol. 2005;192(2):350-359. Rose CH, McWeeney DT, Brost BC, Davies NP, Watson WJ. Cost-effective standardization of preterm labor evaluation. Am J Obstet Gynecol. 2010;203(3):250. Blackwell SC, Sullivan EM, Petrilla AA, et al. Utilization of fetal fibronectin testing and pregnancy outcomes among women with symptoms of preterm labor. Clinicoecon OutcomesRes. 2017;9:585-594. Ochsner Medical Center provides women with the highest quality of care and is ranked among the top 5% in the United States for women’s health. Ochsner is proud to be the only Level 4 Labor and Delivery unit in the state of Louisiana supporting approximately 3400 births per year. Preterm birth is a major issue in our state. According to the most recent March of Dimes report card, Louisiana is 1 of 4 states with an “F” rating for preterm births. We have an average preterm birth rate of 12.6%, with the rate among black women being 50% higher than the rate among all other women. The safety of mothers and babies is paramount at Ochsner, and the talented group of dedicated professionals on staff works tirelessly to improve all aspects of perinatal treatment. In 2015, Ochsner had no early elective deliveries, a low primary cesarean delivery rate, and a low episiotomy rate. 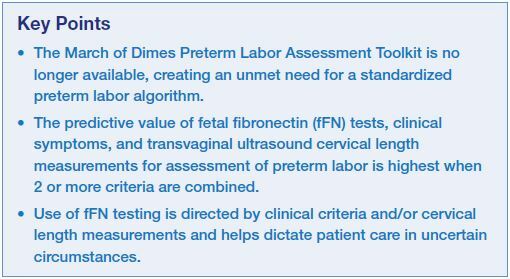 Current technologies, such as fetal fibronectin (fFN)1-3 and transvaginal ultrasound (TVUS) cervical length (CL) measurements,3 have shown value in predicting preterm birth and guiding preterm labor management. For example, a systematic review of the literature demonstrated that combined fFN and CL as measured by TVUS can provide a predictive metric of higher value than either fFN or CL alone.4,5 However, professional organizations such as the March of Dimes and the American College of Obstetricians and Gynecologists (ACOG) either lack current recommendations or do not provide strong guidance on standardized preterm labor assessment. 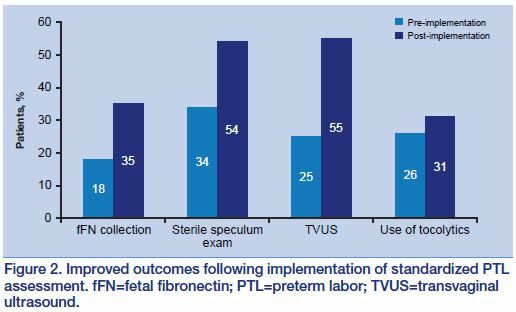 ACOG has suggested that additional randomized clinical trials are needed to confirm the predictive utility of fFN and TVUS CL measurements6; in the meantime, the need remains for access to preterm labor algorithms that use the most current information to direct patient care. 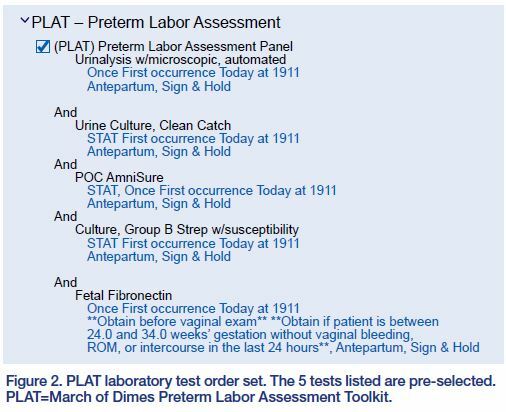 With the Preterm Labor Assessment Toolkit no longer available from the March of Dimes, there is a need for standardized protocols that can be adopted by institutions that currently lack a procedure. Here, 4 evidence-based care pathways developed by the Mayo Clinic,5 Ochsner Medical Center,5 Dr. Michael Ruma, MD, MPH, of the Perinatal Associates of New Mexico, and a Southeastern hospital system are described. These algorithms delineate care to optimize management of women presenting with symptoms of preterm labor at ≤35 weeks’ gestation. Focus within these protocols is on the use of fFN tests in combination with clinical criteria and/or TVUS CL measurements to guide patient care. Transvaginal ultrasound CL measurements and cervical dilation help determine whether fFN samples collected initially will be processed. 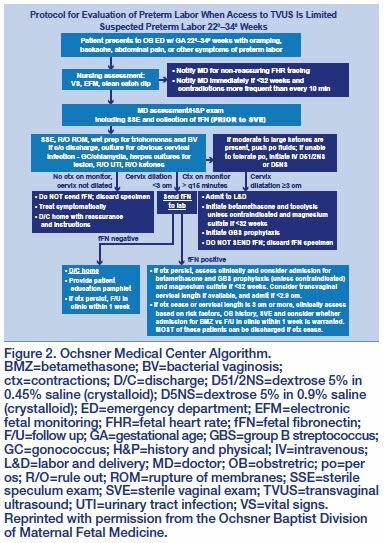 In the case of TVUS CL measurements ≥3 cm, the Mayo Clinic5 and Perinatal Associates of New Mexico algorithms direct practitioners not to send fFN for evaluation, and patients are discharged. In patients with CL ≤1.5 cm (Mayo Clinic,5 Perinatal Associates of New Mexico), fFN is not evaluated, and patients are considered for admission and antenatal treatments. In patients with intermediate TVUS CL measurements, defined as <3 cm but >1.5 cm (Mayo Clinic,5 Perinatal Associates of New Mexico), fFN samples are sent for evaluation to determine the appropriate clinical approach. Thus, a woman with intermediate TVUS CL and a positive fFN result is admitted and treated with antenatal therapies, whereas a woman with intermediate CL and a negative fFN result either remains in the hospital for further observation or is discharged. Standardization of preterm labor assessment and care can improve outcomes and is strongly recommended by ACOG; the American College of Nurse-Midwives; the Association of Women’s Health, Obstetric and Neonatal Nurses; and the Society for Maternal-Fetal Medicine.9-12 Despite the current lack of standardized protocols from ACOG and the March of Dimes, the 4 algorithms summarized here are regularly used in clinical practice; these pathways combine clinical symptoms, TVUS CL measurements, and fFN test results to guide patient care, providing much-needed guidance until standardized protocols are approved. 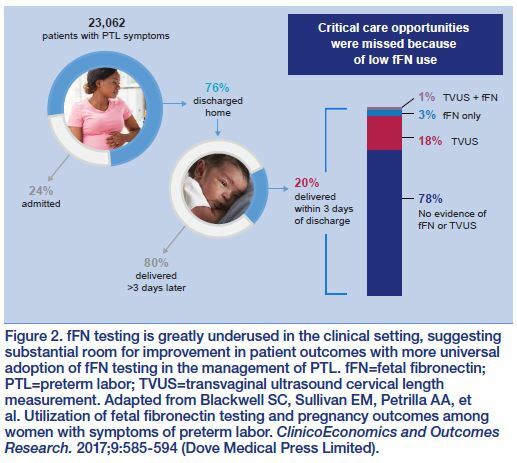 In particular, fFN can be used in combination with either TVUS or clinical criteria/symptoms to assess the risk of preterm birth and appropriately manage care of women with preterm labor. Furthermore, fFN results can guide decisions for patient admission or discharge in cases of intermediate cervical examination or TVUS CL measurement results. Giles W, Bisits A, Knox M, Madsen G, Smith R. The effect of fetal fibronectin testing on admissions to a tertiary maternal-fetal medicine unit and cost savings. Am J Obstet Gynecol. 2000;182:439-442. Joffe GM, Jacques D, Bemis-Heys R, Burton R, Skram B, Shelburne P. Impact of the fetal fibronectin assay on admissions for preterm labor. Am J Obstet Gynecol. 1999;180:581-586. Ruma MS, Bittner KC, Soh CB. Current perspectives on the use of fetal fibronectin testing in preterm labor diagnosis and management. AmJ Manag Care. 2017;23:S356-S362. McCue B, Torbenson VE. Fetal Fibronectin: The Benefits of a High Negative Predictive Value in Management of Preterm Labor. Contemporary OB/GYN. Available at: http://go.medicaleconomics.com/acton/attachment/12262/f-0196/1/-/-/-/-/Fetal-Fibronectin.pdf. Accessed December 19, 2018. Rapid fFN for the TLiIQ System Specimen Collection Kit [instructions for use]. AW-04194-003, Rev. 003. Sunnyvale, CA: Hologic, Inc.; 2017. American College of Nurse-Midwives. Our Mission, Vision, and Core values. Available at: www.midwife.org/Our-Mission-Vision-Core-Values. Accessed January 7, 2019. Association of Women’s Health Obstetric Neonatal Nurses. Quality patient care in labor and delivery: a call to action. J Obstet Gynecol Neonatal Nurs. 2012;41:151-153. Society for Maternal-Fetal Medicine: Publications Committee, McIntosh J, Feltovich H, Berghella V, Manuck T. The role of routine cervical length screening in selected high- and low-risk women for preterm birth prevention. Am J Obstet Gynecol. 2016;215:B2-7. The Upper Peninsula Health System-Marquette, a regional level-3 hospital with a neonatal intensive care unit and ~700 births per year, is staffed by clinicians covering a wide variety of specialties, such as family practice and board certified OB/GYN providers. The hospital is also a maternal transfer facility receiving patients from the entire Upper Peninsula region of Michigan. To effectively implement a change in clinical practice, it was crucial to identify a champion for the cause and provide evidence on which to base the need for change. The team involved in this initiative included a nurse champion, a representative from Hologic, Inc. (Marlborough, MA), and 2 clinicians (one each from obstetric gynecology and family medicine practices). We educated residents, providers, and nursing staff to emphasize the importance and benefits of standardizing protocols to achieve the goal of improving perinatal outcomes. We followed the March of Dimes Preterm Labor Assessment Toolkit (PLAT) and tailored it to fit the needs of hospitals that have no obstetrics units. The toolkit contains an algorithm and an order set. With the assistance of the information technology department, we changed the laboratory order set so that it aligned with the PLAT recommendations, which include risk assessment via transvaginal ultrasound fFN testing.8 Additionally, we met with the laboratory director and quality control personnel to ensure availability of the analyzer for a reasonable fFN test turnaround time of ~1 hour. Printed versions of the protocol were posted in provider offices and meeting rooms. Efforts to encourage adoption of the standardized protocol included lunch and dinner lectures with internal healthcare providers and in-service training for external providers. The providers and nursing staff were educated on the correct procedures for speculum exams. Additionally, specific steps in the protocol were emphasized, particularly the need to collect the fFN sample before any vaginal exam. Although it was challenging to convince the physicians to adopt the new standardized protocol, communication of pre-implementation outcomes data from our facility were effective to demonstrate the need for improvement and drive changes to the clinical practice. The nursing champion primarily took responsibility for spearheading the efforts for standardization. To demonstrate the effectiveness of using a standardized protocol, we compared pre- and post-implementation patient data using preset criteria, including codes for threatened PTL and gestational age 24 to 36.6 weeks. Pair-wise comparisons of time to discharge from triage, maternal admission rate, and time to delivery from evaluation were performed using Tukey’s multiple comparison test. Data from 90 pregnant women admitted to the hospital before implementation of the standardized protocol were compared with a cohort of 91 women post-implementation. Eleven women in the pre-implementation group and 0 in the post-implementation group delivered preterm. Following implementation of the protocol, the average time in triage decreased by nearly half, from 4.5 hours to 2.6 hours, resulting in a savings of~$340,000 in triage costs. Compared with pre-implementation, maternal hospital admissions were reduced by 78% (9 vs 2 patients, excluding transfer patients). This was associated with a savings of ~$150,000 in admissions costs. 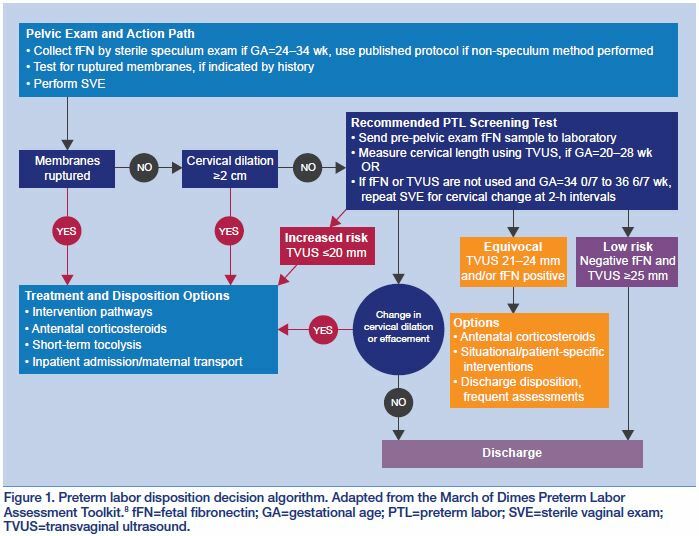 Results also demonstrated an increase in the number of speculum exams after implementation of standardized PTL assessment. Sample collections for fFN testing and cervical length measurements nearly doubled (Figure 2). Additionally, implementation of the standardized protocol reduced variation in practice and allowed physicians to defer interventions to only those in true preterm labor, thus decreasing the overall use of tocolytics. In a resource-limited hospital, through the concerted efforts of a nursing champion, a representative of Hologic, and clinicians, we were able to effectively implement a standardized protocol for PTL assessment, which translated into improved obstetric outcomes and cost savings for our facility. 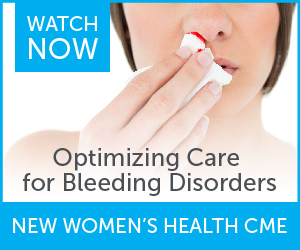 Adoption of an evidence-based standardized protocol led to a reduction in triage times and unnecessary interventions for women not truly in PTL. Our experience can serve as an example to other hospitals wanting to undertake standardization of their PTL assessment as a quality improvement initiative with the added benefit of also driving cost savings. American College of Obstetricians and Gynecologists. Levels of maternal care. Am JObstet Gynecol. 2015;212(3):259-271. Hutchinson FH, Davies MW. Time-to-delivery after maternal transfer to a tertiary perinatal centre. Biomed Res Int. 2014;2014:325919. Musson RE, Harrison CM. The burden and outcome of in utero transfers. Acta Paediatr. 2016;105(5):490-493. Giles W, Bisits A, Knox M, Madsen G, Smith R. The effect of fetal fibronectin testing on admissions to a tertiary maternal fetal medicine unit and cost savings. Am J Obstet Gynecol. 2000;182(2):439-442. Parisaei M, Currie J, O’Gorman N, Morris S, David AL. Implementation of foetal fibronectin testing: admissions, maternal interventions and costs at 1 year. J Obstet Gynaecol. 2016;36(7):888-892. Deshpande SN, van Asselt AD, Tomini F, et al. Rapid fetal fibronectin testing to predict preterm birth in women with symptoms of premature labour: a systematic review and cost analysis. Health Technol Assess. 2013;17(40):1-138. Rose CH, McWeeney DT, Brost BC, Davies NP, Watson WJ. Cost-effective standardization of preterm labor evaluation. Am J Obstet Gynecol. 2010;203(3):250 e251-255. March of Dimes. Preterm labor assessment toolkit. Available at: https://www.marchofdimes.org/preterm-labor-assessment-toolkit.aspx. Accessed December 19, 2018. WellStar Kennestone Regional Medical Center (Marietta, GA) is a large, suburban hospital that performs ~6000 deliveries per year and has a level 3 neonatal intensive care unit. Patient safety is the key goal, along with striving to identify and implement evidence-based clinical practice to improve patient outcomes. Accurate identification of women at increased risk of imminent preterm birth continues to be a challenge that is further compounded by wide variation in clinical practices employed to evaluate and manage preterm labor (PTL).1 The March of Dimes Foundation emphasizes the need to standardize PTL assessment to improve maternal-fetal outcomes and, until recently, has made available the Preterm Labor Assessment Toolkit (PLAT), a step-by-step guide to help healthcare providers and hospitals facilitate implementation of a standardized protocol for identifying women in PTL.2 The most recent iteration of the March of Dimes PLAT is currently under revision; however, the components of the toolkit are similar to widely used algorithms and order sets used at hospital systems across the United States and rely on standardization of PTL assessment using a combination of fetal fibronectin (fFN) and transvaginal ultrasound (TVUS). The American College of Obstetricians and Gynecologists (ACOG) strongly encourages the standardization of practice to improve outcomes and advises that protocols and checklists can reduce patient harm.3 Furthermore, ACOG recommends that the development of protocols be a collaborative, inclusive, and multidisciplinary process. By providing clear guidelines for triage, implementing standardized nursing protocols, and updating organizational policies, healthcare systems have the opportunity to reduce patient harm and improve maternal health outcomes. 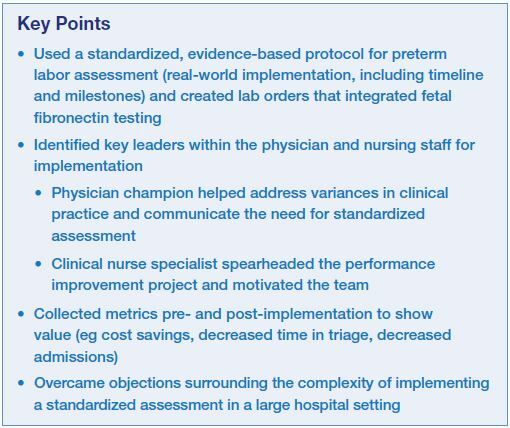 Described here is an experience in using the March of Dimes PLAT to implement a standardized evidence-based protocol for PTL assessment. This system-wide initiative stemmed from the need to improve maternal outcomes, reduce the rate of preterm birth, and curtail unnecessary healthcare expenditures. In 2015, the Atlanta, Georgia, area received an F grade for preterm birth rate (≥11.5%) in the March of Dimes report card.4 As an institution committed to providing a high standard of care, WellStar welcomed the opportunity to implement standardized PTL assessment as part of an evidence-based approach to clinical practice. WellStar implemented a shorter version of the March of Dimes algorithm, which was embedded into the institutional policy, thereby also aligning with the Joint Commission requirement that the protocol be embedded into the policy and readily available. Initiating a system-wide change in clinical practice for a large healthcare facility can be challenging. Both preparation and implementation need to be collaborative, involving participants from multidisciplinary teams for successful implementation. The multistep process involved in preparing for standardization of PTL assessment began with a needs assessment to identify the scope of the problem and define goals. A schematic timeline for implementation is shown in Figure 1. The process involved a multidisciplinary team that included a physician champion, a clinical nurse specialist, triage nurses, the Department of Public Health, and a representative from Hologic, Inc. (Marlborough, MA). Because credible data drive behavior change, we collected data on triage times, disposition times, wait times, PTL rates, and costs before beginning implementation of a standardized PTL assessment process. These data were provided to the team to underscore the need for improvement, explain outcome goals, and facilitate a change in clinical practice. A physician champion committed to improving health outcomes was identified. In addition to communication with other hospital staff, the physician champion assisted with developing the PTL assessment order set. A laboratory panel was created, which consisted of fFN, urine culture, culture for Group B streptococci with susceptibility, and microscopic urinalysis (Figure 2). 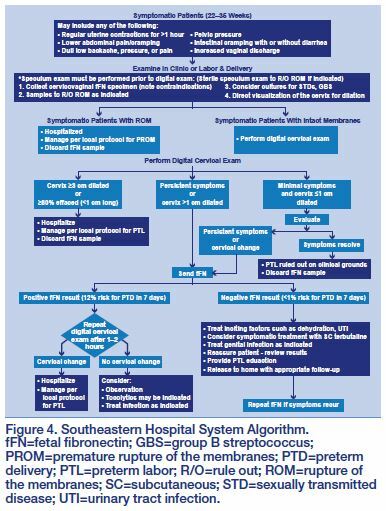 The PTL assessment protocol was available in an electronic format and was also posted in the triage areas. WellStar faced a number of challenges when preparing for and implementing the standardized PTL assessment protocol. Given the large size of our facility, there was a need to employ multiple channels of communication to disseminate information on the new standardized process across multidisciplinary teams. Additionally, wide variation in clinical practice is an area of vulnerability for a large hospital. Having a dedicated physician champion to communicate the rationale and the goals of the standardization process was pivotal. Of note, 1 challenge that WellStar faced with collection of outcomes data was use of the triage sign-in book to collect data on triage times manually. Recent improvements in the system-wide use of electronic records will enable more efficient data collection in the future. Adoption of a standardized, evidence-based protocol for PTL assessment facilitates management of PTL by evidence-based approaches to clinical decision making. 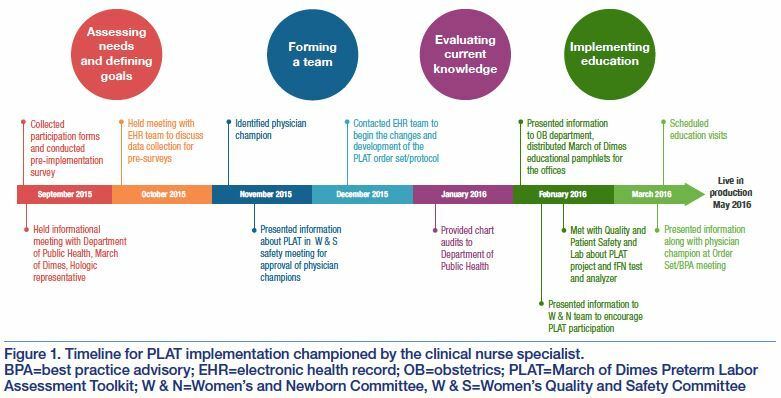 A multidisciplinary team approach, including the involvement of physician or nurse champion, has been crucial in enabling the implementation of evidence-based standardized PTL assessment at WellStar. Successful implementation resulted in improved PTL outcomes and reduced healthcare costs. The process and protocol followed at WellStar can serve as a model for other healthcare systems in standardization of their PTL clinical management pathways. Hueston WJ. Variations between family physicians and obstetricians in the evaluation and treatment of preterm labor. J Fam Pract. 1997;45(4):336-340. Committee on Patient Safety and Quality Improvement and Committee on Professional Liability. Committee opinion no. 629: clinical guidelines and standardization of practice to improve outcomes. Obstet Gynecol. 2015;125(4):1027-1029. March of Dimes. 2017 premature birth report cards. Available at: https://www.marchofdimes.org/mission/prematurity-reportcard.aspx. Accessed December 19, 2018. March of Dimes. PeriStats. Available at: https://www.marchofdimes.org/peristats/Peristats.aspx. Accessed December 19, 2018.
van Baaren GJ, Vis JY, Wilms FF, et al. Predictive value of cervical length measurement and fibronectin testing in threatened preterm labor. ObstetGynecol. 2014;123(6):1185-1192. Perinatal Quality Foundation. Cervix measurement criteria: measurement of the cervix. Perinatal Quality Foundation. Available at: https://clear.perinatalquality.org/Docs/image_criteria.pdf. Accessed February 21, 2018. MED-00342 ©2019 Hologic, Inc. Hologic, RapidfFN, TLiIQ, and The Science of Sure are trademarks or registered trademarks of Hologic, Inc. and/or its subsidiaries in the United States and/or other countries. The physician authors of these articles are paid consultants of Hologic, Inc. Editorial and financial support was provided to the authors by Hologic in connection with the development of this document. Which of the available tools are you using to determine which patients will deliver imminently and which can be discharged home? Despite advances in supportive care for preterm babies, utilizing the available tools to identify those patients who should be admitted immediately and those who are likely to deliver at term is essential—not only for the health of the mother, but also for her baby. That’s why this monograph brings together experts in the field of obstetrics and maternal-fetal medicine to share their experiences and opinions in addition to the most up-to-date literature on preterm labor assessment.